On selected Fridays, I will be highlighting our family favourites in different categories- meals, drinks, outings... you name it! And of course suggestions are welcome! I love reading about other mom and family favourites. I often make purchases or change my method of doing something after reading blogs and certain tips have really improved my life... who knows, maybe reading ours, it will make some readers lives easier, more fun or more pleasant. Besides, as this blog is also serving as a bit of a journal/time capsule, imagine reading back 10 years from now and seeing what we couldn't live without-- always good for a laugh. I am a big fan of the fall produce. 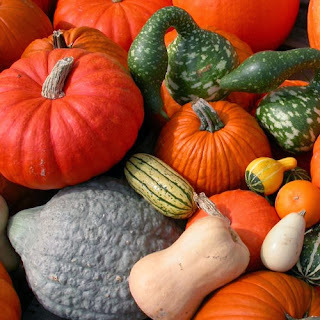 From the different squashes to the pumpkins to the variety of apples available, they are all so yummy. In fact, I buy lots of fall produce almost year round (thanks globalisation) but I really love the freshness of this stuff at this time of year. I have so many different recipes, most of them from online. My pumpkin poppers are a big hit in this house... My dad, daughters and Darin all love them! I also make huge batches of healthy butternut squash and pumpkin soup with loads of spicy goodness. I look for all the different types of pumpkins and squash and try my best to make different seasonal recipes- my sausage stuffed acorn squash is also a big hit around here. This weekend, I am also going to try these highly rated fall muffins. There is something so warm and relaxing about candlelight in the colder months. I love candlelight at night and when we're all at home, I keep a candle lighting all evening and each weekend. I also vary the scents in the house based on the seasons-- lilac for spring, pumpkin for fall and vanilla for Christmas. When my girls grow, I want them to remember our house all scented and warm when they were younger. I buy candles from many different places but these days I am obsessed with the three wick candles from Bath and Body Works. 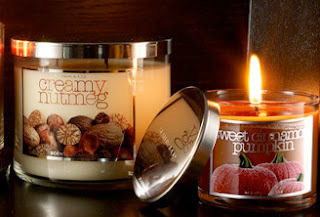 Their autumn scents are, as the tweens would say, amaze-balls! My absolute favourites are Pumpkin Caramel Latte and Pumpkin Cupcake. It smells like you're baking treats. And when they have their sales, you can almost get two for the price of one.... really, it's like they're giving them away! But not really, 'cause they're still kind of pricy.... the amount I buy anyway. I use cloth scarves whenever cold- even in the wintertime when most people switch to wool. They're such a fun way to dress up an outfit! Fall is the perfect time to bust them out after their summer hiatus. I start wearing them even before I pull out my jackets. 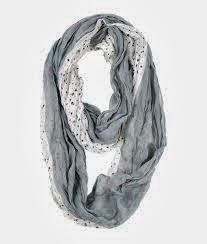 I especially love infinity scarves. My favourites are from Express like this one. Enough said. New seasons of all my favourite shows. From Grey's Anatomy to Revenge, Modern Family to Katie (yes, Katie), fall signals the start of the new TV season! At least once each fall, we do a pumpkin patch where there is usually a fall festival involving some sort of maze, haystack, pumpkin slinging, games etc . We also visit at least one farm with some sort of a petting zoo and of course a bakery. This year we added apple picking to the line up! Some of my favourite special holidays are in the last half of this year. In October, we have our Canadian Thanksgiving. Then Halloween. Then Divali. Then all the pre-Christmas stuff. We're always busy meeting up with family and friends to celebrate these special occasions. Maybe fall's not so bad after all! !